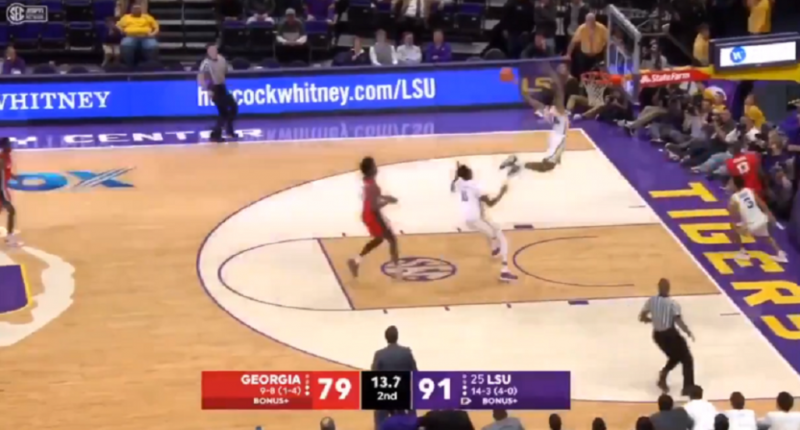 LSU had a 12-point lead in the final seconds of Wednesday night’s SEC basketball game against Georgia, and decided to get cute with the game out of hand. The Tigers tried an off-the-backboard dunk and failed miserably. Georgia’s Rayshaun Hammonds got the rebound, pushed the ball down court, and found Tyree Crump in the corner for a three which Crump drained to make it a nine-point game with 4.3 seconds left. These developments were of course meaningless for the ultimate game result, but were very important for anybody that bet on the point spread. LSU was an 11-point favorite, and this was now a nine-point game. Well, Georgia then fouled LSU for some reason with 2.8 seconds left, giving the Tigers to tie the game up at the free-throw line. But LSU’s Kavell Bigby-Williams made only one of the two free throws, and Georgia missed a three from half-court. Final: LSU 92, Georgia 82. Ah, the dangers of betting, particularly on the point spread. That’s one heck of a bad beat.